One of the most amazing things about Afghanistan at night where I was deep in the desert, were the stars. I haven't seen stars like that since I was a kid and we'd go out in the desert in New Mexico away from all the lights and lay on the hood of our car and watch for shooting stars. Sometimes I would just catch myself starring up at the heavens in awe and wonder why we as humans keep getting ourselves into these wars with one another. I just don't get why we can't all live together on this planet and I'm afraid it's going to take aliens from another solar system to unite us. Then I would suddenly remember where I was, in a combat zone and know that inside the camp I was being monitored and they were probably wondering what I was doing. It was funny how self conscious I felt in the dark, knowing people inside were watching me on the infrared monitor and outside at the guard posts. It was weird with such amazing natural beauty above us I was in this US military camp with concertina wire, guard posts, mortars aimed and ready to fire and LATV's and MRAP's parked to block other vehicles from coming in. I never felt afraid. Which is only because I am an American of a certain generation and still have that luxury. I wonder how many more generations will be able to experience my purity? 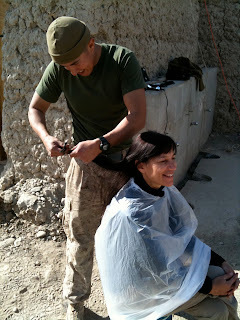 I can't believe I've been back almost 2 weeks from Afghanistan. At times it seems like I'm in some kind of limbo and not really back and not there in Afghanistan...I'm just floating. I know I was there, I can still taste the grit of fine sand in my mouth and see a dun colored desert landscape even though I'm looking at a park of green trees. I feel like my brain has been ratcheted tightly down in one direction. But if I'm patient it will unwind. What I am going through is small in comparison to our military who are deployed to war. Their brains have sprung and spit bits and pieces apart like an antique watch dropped on the concrete. They have to figure out how to put the pieces back together to be able to fit back into society. This is the famous/infamous Pizza Hut on Camp Bastion. I doesn't quite fit. The American troops I talked to didn't really like it. It was too weird a juxtapositon. With the Military's attempt to bring all the comfort of home to war, it will take some getting used to. But as Ernie Pyle said, "Killing and war is as much a job for them as writing is for me." This is the Battalion Aid Station on Geronimo. Tommy Childress is the Chief Battalion Medical Officer from Houston, Texas. Besides treating basic medical they are also have an ANA (Afghanistan National Army) training academy on basic fundamentals such as 1st aid, hygiene, basic CPR. They have treated some civilians, but the ANA Base just got their own university trained doc. Neither base has x-ray or laboratory facilities. Those patients are medivaced out to Dwyer or Bastion. Bastion has the best field hospital in the world. If you've been reading my blog you will remember I had to have SEVERAL inoculations. I had decided not to have the Rabies inoculation as it cost $1,000.00! I am gad I made that decision because if you get a scratch from ANY animal you are medivaced out and given the Rabies treatment! At every base, no matter how primitive, there is a table set for the fallen troop. It is a sobering remembrance of war. When the Marines of the 3rd Battalion, 5th Regiment, deployed to the Sangin district of Afghanistan's Helmand province in late September, the British soldiers who had preceded them warned the Americans that the Taliban would be waiting nearly everywhere for a chance to kill them. In WWII they carved initals and sayings into their rifle butts. One troop even went so far as to hollow out a circle and put a picture of his girlfriend or wife in and then cover it with probably a watch crystal for her to be forever in battle with him. In Vietnam they wrote sayings and calendared their helmets with the days left to go home. 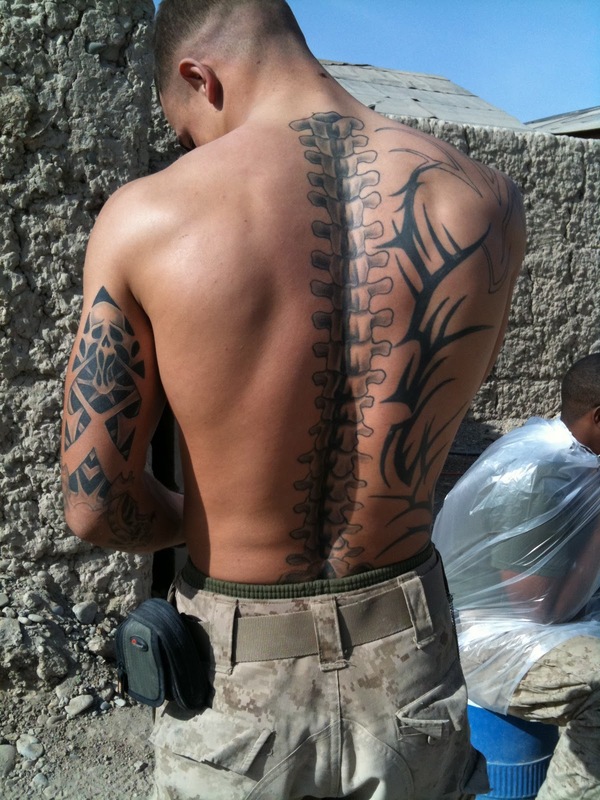 Here in Afghanistan there's body ink. Most of the Marines I met immotalized their lost brothers. Some had several names tattooed on their arms with art portraying who they lost, to be carried forever. Gunny Schadle had his wedding ring tattooed so he always had his wedding ring on, even in battle. 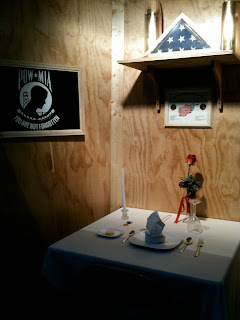 Here is a beautiful work of art on Corporal Austin Hershaw. It gives new meaning to the 'art' of war. Hygiene is very important in the Marine Corp. All the Marines in Spenghar look liked they had showered everyday, which I know isn't true because of the difficulty of showering there. But they all shave and take care of their appearance and an outsider wouldn't have a clue. This is all done without any running water. I love this picture of Sgt. Christian Flores 'bowling up', I believe Sgt. Chase of Jacksonville, FL. My notes are a little fuzzy. What I love about it is how he has his M-16 and 9mm on while cutting hair. While SSgt. Sergio Fernandez specializes in the 'low fade', I had no problem trusting Fernandez with my hair. And I'm glad I did as I got one of the best cuts of my life and I've had some very expensive hair cuts! He learned how to cut hair at home. I told him if he ever opened a salon in the States when he returned, I'd be there. SSgt. Fernandez and Sgt. Flores had quite a brisk business this day and had the boom box playing some great Spanish music. 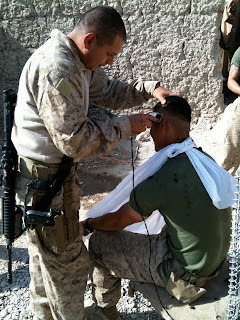 I felt like I had walked into a barber shop in E. LA.